Read more about lawyer wellness here. 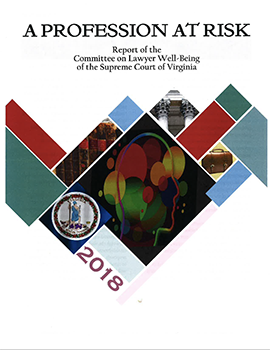 “A Profession at Risk” – that’s how the Supreme Court of Virginia Committee on Lawyer Well-being describes the legal profession in a new report released today. Spurred by recent studies showing dramatically higher percentages of alcohol and drug abuse, depression and anxiety, and attempted and completed suicide among attorneys and law students, the report includes recommendations for the judiciary, law schools, the private sector, and the public sector – as well as structural and funding changes to the legal profession as a whole. Specific recommendations include: creating a position within the Office of the Executive Secretary of the Supreme Court, providing adequate funding to Lawyers Helping Lawyers, and developing continuing legal education on a wide range of wellness topics. taking incremental steps to change how law is practiced and how lawyers are regulated to increase well-being in the profession. Chaired by Justice William C. Mims, the committee includes lawyers and judges from across the commonwealth and from a variety of backgrounds. The report emphasizes that the wellness crisis threatens the integrity of the profession and members of the public, as behavioral health and substance use disorders are often the root cause of disciplinary actions against lawyers. “[T]he proposals in this report are conceived from a profound conviction that the personal health and wellness of legal professionals are inseparable from the duty of such professionals to provide competent services to the public and ensure its protection,” it states at the beginning. The committee formed last year in response to an ABA-initiated task force on lawyer well-being whose August 2017 report on the topic is a rallying point for bars across the country grappling with the outsized impact of mental health issues and substance abuse on the legal community. Several of the bar’s recent rule changes and legal ethics opinions — some proposed and some already adopted — got a head start on some of the report’s recommendations. They, for example, offer lawyers a chance to retire with dignity in certain circumstances and allow VSB counsel to do a one-way referral to Lawyers Helping Lawyers of an attorney that bar counsel feels may need assistance. The Virginia State Bar encourages lawyers to read the full report.